I DON’T OFTEN QUOTE CHRIS SCHWARZ, but he wrote this in a blog post today – “It’s done when it’s done, no sooner.” He was referring to some impatient readers who had complained why certain book projects were taking so long to finish. So what does that do with me? I am not one of his impatient readers; rather, I am trying to rush the completion of my daughter’s bookcase project. To satisfy his complainers, Mr. Schwarz would have to rush book projects along. I came to the realization this morning that this bookcase project was just going to have to run its course. No matter how many self-imposed deadlines I make known to others, this project will be completed when it’s ready. The photo above shows the condition of my workshop just moments ago. I snapped the photo to enter as evidence that I am working diligently to get the bookcase finished. My workshop often becomes a mess as a project nears completion because that is the focus: completion. Being organized obviously isn’t high on my to-do list now. My workbench from earlier this past week. 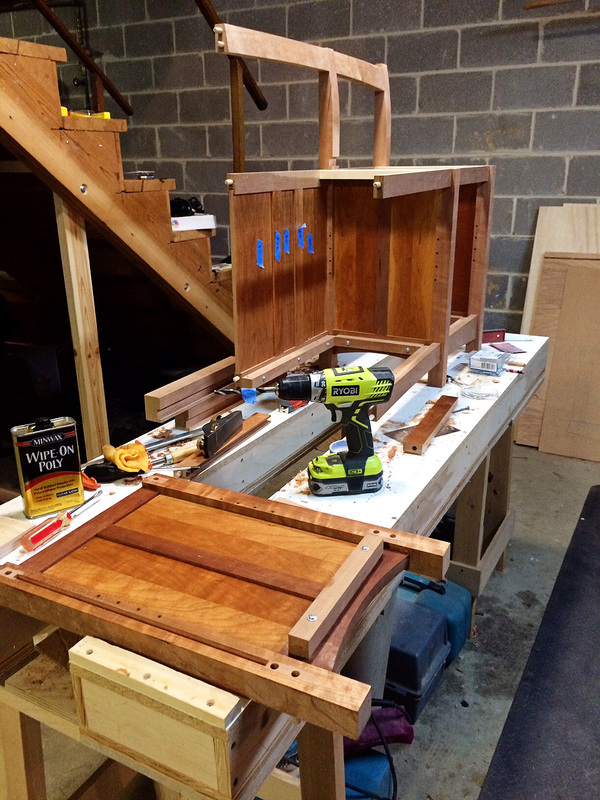 This week, I began to dis-assemble the bookcase; organize some sub-assemblies and begin glue-up. My plan was to glue together the various aprons, stretchers and crest rails – do the left side first, followed by the right side and then bring them together by adding the middle components. After this was accomplished, I would add wipe-on polyurethane to the unfinished parts. As I began to get organized on the left side sub-assembly, it became clear that I needed to do some additional hand planing (smoothing) and fine sanding prior to glue-up. That lead to my understanding that pre-finishing many of these same parts would be easier prior to glue-up. This meant a change of plan: instead of glue-up for final assembly followed by final application of poly, I would do both of these things as I progressed through glue-up. 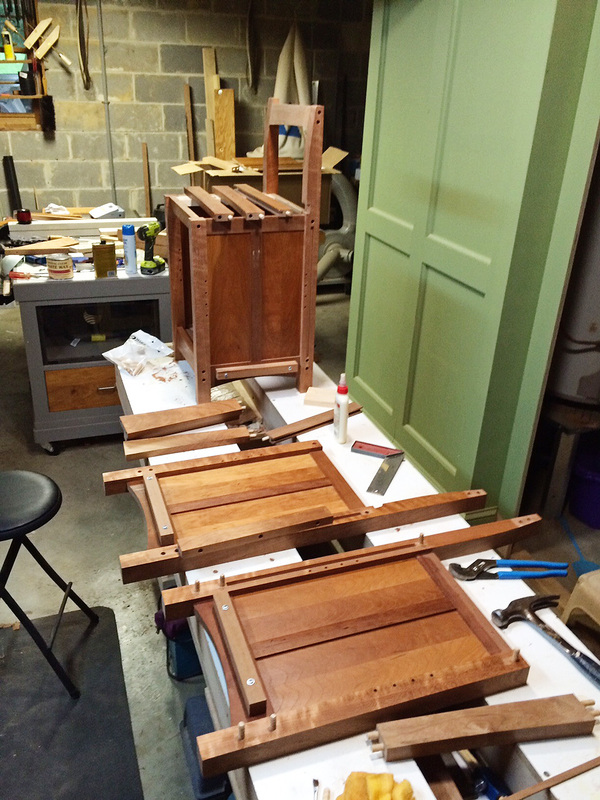 The current photo – left side glued-up, right side getting ready for glue-up. P.S. – We are going to spend a week in Asheville, North Carolina. My wife loves the North Carolina mountains; I do too, but Asheville is like woodworking heaven as well. 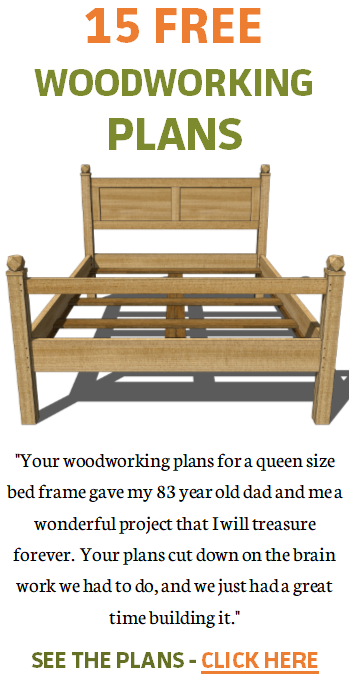 I already have a woodworking class lined up with Scott Meek and I am trying to schedule a second class with someone else while we are there. Pretty cool!!! I think we will have more fun than is fair to have. It has been a long time since I have been in Asheville. My wife was there more recently. She says it is very different, in a good way. I can’t wait for the trip. I empathize with your feelings. No matter what I do, it always takes longer than I had hoped. About the finishing part. I always finish the parts before final assembly. I even pre-finish raised panels before framing it. I am currently building a new dining room table which extends with drop-in leaves. I am sanding, staining, grain filling, sanding, and finishing/sanding the legs, aprons, everything now. We will discover what it looks like just before the first meal we eat on it. I also design my projects in modules. That will make it much easier to move it from my basement shop to the upstairs where it will undergo final assembly. I recently built a pair of beautiful oak filing cabinets to replace the old steel ones that support the desktop in my computer room. All the parts were finished first, then brought to the computer room, where both cabinets were assembled up-side-down – attaching them to the desktop. Then the entire thing was raised as one piece. I am amazed that you have the time (and energy) to document your work the way you do. More power to you, buddy! Chuck, typically, I complete a project and then add finish. But, I know from past experience that applying finish to the interior of cabinets is very difficult to do well. So despite my plan to complete construction of this long-term project this weekend, it is just better to take my time with it. I can echo your thoughts completely. I’ve started my own personal project aka John’s Armoire and life just gets in the way. Between paying commissions which always get priority and vacations, visitors coming to Las Vegas, and just every day chores we have to do I’m way behind my “schedule” yep — it’ll get done when it’s done! Congrats on your 30th. Congrats on the anny Jeff! Your post is great. I used to tell my kids something similar when I would get the “are we there yet?” I’d say ” we will be there when I stop the car and get out.” Any way no need to rush, especially on a piece as nice as this. But, that being said, I sometimes find myself hurrying myself along, just to be done. More like you say “self-imposed” than anything. 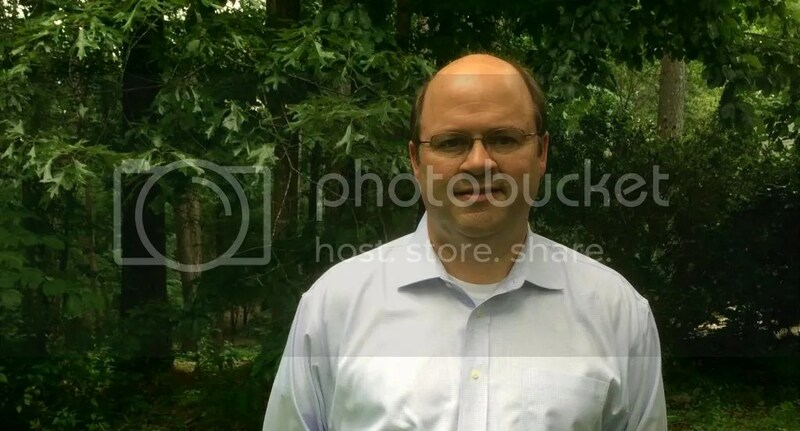 Jeff, I just happened on to your site from your comment on someone else’s. So glad I found you. I may never actually *do* any of the projects, but I’m going to love reading about them! Can’t wait to see the finished window seat bookcase, something I’ve always thought I should have!